You have the ability to get through the challenges you face. If you really want something, you will find a way. If not, you will find an excuse. Stop thinking about why you can’t do it and start believing that you’re fully capable. Stop worrying that the challenges are too great and start focusing on why you must make it through. The only person holding you back is you. Not making a choice is making an excuse. It’s time to choose what’s best for you. Often, when we feel stuck, we’re waiting for something magical to happen. What’s magical is what we do to overcome our current situation. We spend so much time wondering when life will begin to go our way, instead of acknowledging our circumstances and building a road through the challenges. What changes do you need to make to succeed today? What do you need to do to overcome the obstacles in your path? 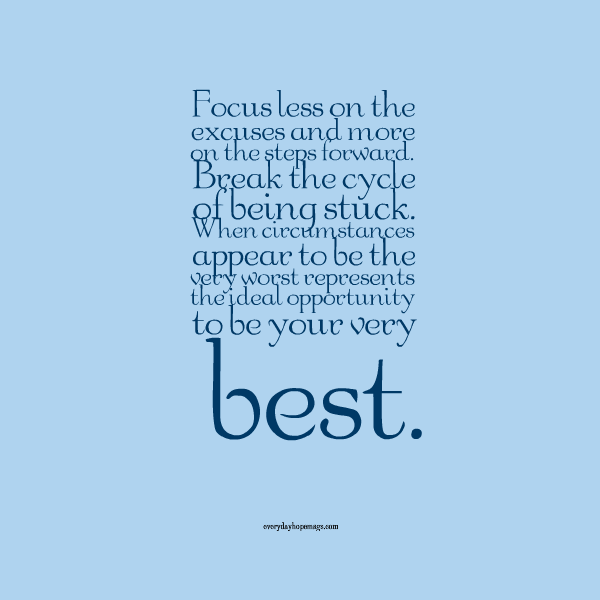 Focus less on the excuses and more on the steps forward. Break the cycle of being stuck. When circumstances appear to be the very worst represents the ideal opportunity to be your very best. After all, the most profound breakthroughs often dawn from a prolonged period of feeling stuck.